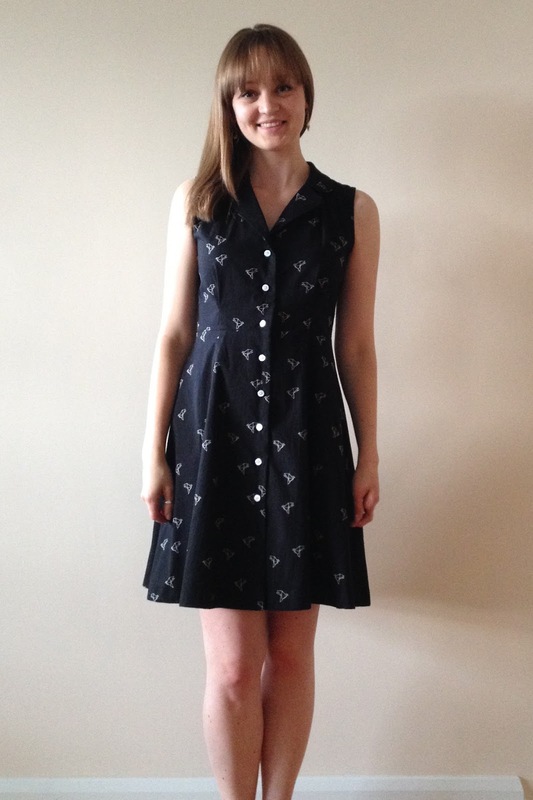 So it would seem this is going to be the summer of wearing shirt dresses for me! A couple of months ago the lovely ladies at Sew Over It asked me to test their latest release, the Vintage Shirt Dress. After falling head over heels for their Ultimate Pencil Skirt pattern (I'm still looking for a big vivid floral print to make my third out of!) I jumped at the chance to try this dress. I was also really happy with the way they responded to the tester feedback and how readily they incorporated suggested changes last time and this occasion was no different. As with all their patterns the design is really classic and wearable and features pleats in both the bodice and skirt to give the dress it's shape. I was a little concerned that this style might feel a little too feminine for me as I was keen to make a casual dress and tend not to dress that girly from day to day; but for me personally the skirt has the perfect amount of flare and fullness to avoid feeling over dressed. 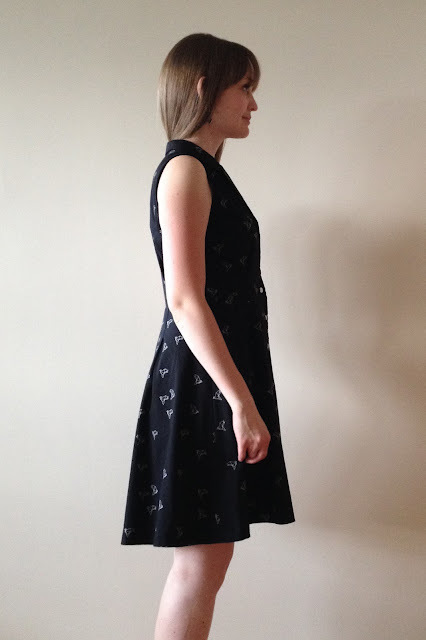 I chose the sleeveless version to make a breezy summer dress. I don't own many dresses with anything longer than a short sleeve, I'm not sure why I don't tend to wear them. However, I forget what it was I was watching the other day, but I spotted a stunning navy blue silk shirt dress with three quarter length sleeves which was almost an exact match for this design. I now can't stop thinking about making one in a scrumptious silk moroccan or double crepe...this pattern does eat up a lot of fabric though so I might need to win the lottery first! As I was testing the pattern sewed up the straight size 8 with no adjustments. The only change I made was to take 1.5" off the length of the skirt and use 1" for the hem to suit my personal length preferences and also my lack of height! I chose the size 8 based on my previous experiences with Sew Over It patterns, despite my measurements falling between the 8 and 10. The finished result doesn't nip in at the waist quite as much as I'd hoped it might so I'd skim an inch or two off of here next time. I should have paid more attention to the finished measurements on the back of the envelope as I would have seen that there is quite a bit of ease included in this area! Other than that I'm really happy with the fit, especially across the shoulders where I often have trouble. Looking at the side on photo I can see the hem is sitting slightly higher at the front than the back, I think this means I need to look at the length of the front bodice so it's something I'll try and address next time. Getting the waist to fit snuggly will probably help everything sit a little neater too! I was able to choose my fabric from the Sew Over It online shop and jumped on this Atelier Brunette origami birds cotton lawn. In my quest to make this not too girly I thought this monochrome design was a good choice to give it a bit of edge. I must admit I was a bit rubbish at keeping track of how much yardage I needed for this one but I'd say I used around 2 metres. 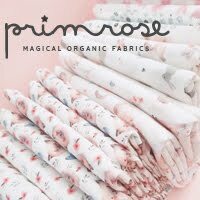 It's a beautiful quality lightweight cotton that's lovely to sew and wear but I must say I was surprised at how sheer it was when it arrived! I decided that it was going to need lining if I was going to wear it in the sunshine. I used a plain black cotton lawn from Classic Textiles on Goldhawk Road for this, it's of almost exactly the same weight so worked perfectly. The plan was to underline the bodice pieces as that seemed easier than trying to draft lining pieces to work with the facing, then use the lawn as a separate lining in the skirt. However I changed my mind at the last minute and underlined the skirt pieces too to give them a bit more structure and body than the warty quality the two separate layers would have had. As I had two layers of fabric going on I deliberated for a while about using interfacing on the collar and facing pieces as I didn't want them to end up too thick and stiff. I decided to use the lightest weight interfacing I could get my hands on and am pleased with that choice as it's helped that front placket and buttons sit nice and securely. Now I've got some experience with sewing under my belt I'm fully on board with the appreciation for the difference good quality interfacing makes so for this project I purchased some from Maculloch & Wallis on Poland Street. They had a great selection, all of good quality and this particular one was £4.30/m which I didn't find too unreasonable for a central London supplier. 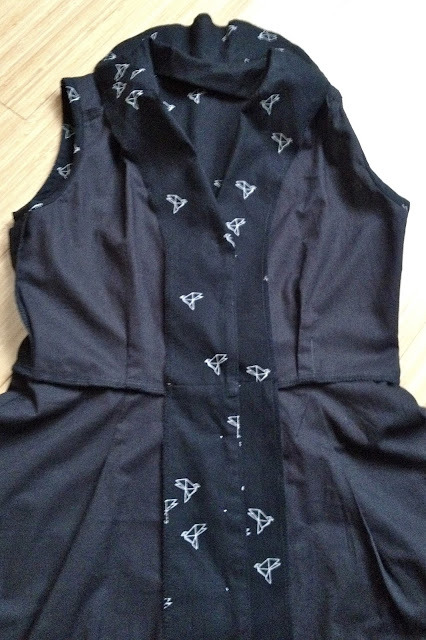 The buttons are just simple white shirt buttons from my stash. I laid out black ones at first because I wasn't sure that I wanted to make a feature of them but I felt the white ones gave the whole dress a lift and brought out the design. While I'm thinking about buttons Emmie posted a great tip about how she prevented gaping between the buttons at the waistline of her version of this dress. Well worth checking out! All in all I had a great experience with the test version of this pattern. I had very few comments to make and found the instructions and illustrations to be very clear. You end up with a beautiful clean finish inside too; the armholes are finished with bias tape, the facing is under-stitched and the hem and the facing end up meeting super tidily as you can see above. I think this would be a great project to tackle if you've got some simple garments under your belt and fancy tackling some new techniques like a straightforward collar and buttonholes. 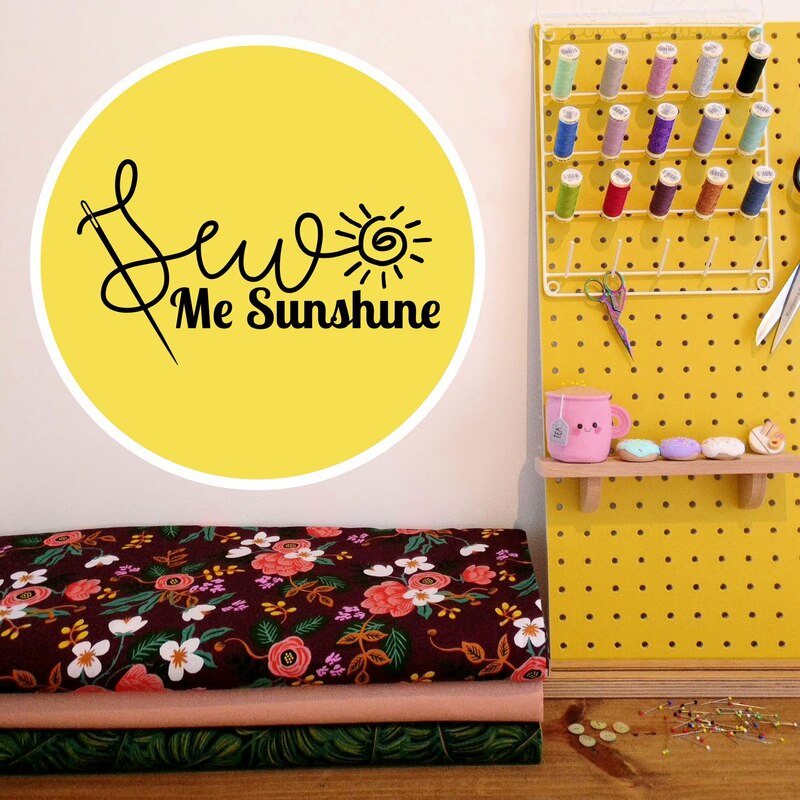 If you've fallen a little bit in love with this pattern I've got some good news for you! 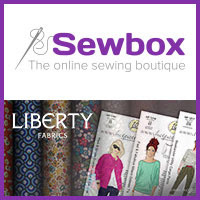 Sew Over It have provided me with a copy of the pattern to giveaway to one of you and also a voucher code for a 20% discount off the pattern from their online shop. I've been a bit tardy about getting the photos done for this post so unfortunately the code is only valid until Wednesday 10th June at midnight GMT but there's still time if you get on it quick! Just enter FIONA20VSD at the checkout. If you would like to enter the giveaway just leave a comment on this post before midnight GMT on Saturday 13th June. Please make sure to leave your email address if it is not easily visible in your profile so I can contact the winner on Sunday. If you'd like to tell me what fabric you'd ideally sew this pattern up in too then I'd love to know! Good luck! I just love this pattern! Shirtwaists are one of my favorite types of dresses and are really great for any occasion. I've never made one though! I've just been too scared, lol. This one has lovely details though, so I think it would be a great one to try. Thanks so much for the giveaway! I love your dress! I had the same problem with the sheerness of this fabric. Oh, what a lovely dress! I love your fabric choice! I would sew it in Liberty cotton lawn called Morris I have been hoarding. That looks so cute! I love the fabric choice. I've never made a shirtdress before, but maybe I would choose a chambray? This looks soooo good. It looks so professional and I think the fabric is perfect. Makes it just casual enough, but still feminine. I absolutely love every version of this dress I've seen so far and yours is no exception. Great fabric choice and it's really useful to hear how you underlined it. I seem to have a knack for picking fabrics that are marginally too sheer to leave unlined! Looks great! I love the two - tone version she is showing that makes it look like separates. I might have to try that some day! I've seen so many wonderful versions of this dress over the last few days, yours included. I'd like to make one in a fine cotton like you did. Love your black interlining. Gorgeous make - your finishings look so beautiful and professional! Great dress! The fabric and pattern combination is perfect. And thanks for linking to that waist gape tip- genius! Such a cute pattern - love your version! I'd love to make a sleeveless one in linen! I have a large scale plaid set aside for a shirt dress and this pattern may be the one I've been waiting for. wow this looks beautiful and i really love your fabric choice. i have a lot of different fabrics in my stash which could work well with this pattern but i think a cotton retro red fabric might be the one. Your dress is gorgeous! I love the fabric and the white buttons. I don't know what fabric I would use for it, but thank you for the chance of winning the pattern! Ooh yes please. I got a cloud 9 biology print for my birthday which would be perfect for this. This is lovely. I love your choice of material, pretty without being foofie. I could see this being a 'go to' pattern for my work wardrobe, as a T.A. I actually have a pretty white cotton, with tiny rose buds, sitting in my stash, which would be great with this. Either that or a navy cotton with a tiny Paisley print (I like tiny prints ;-) in pink. This is a beautiful pattern, looks perfect to teach myself button holes. No Idea what I'd make this dress up in. Maybe a really crazy wax print? I love that Atelier Brunette fabric. Shame it is so sheer! Please count me in for the giveaway. Thanks! Gorgeous pattern. I would sew it in a lightweight chambray. Oh wow, this is just gorgeous Fiona! 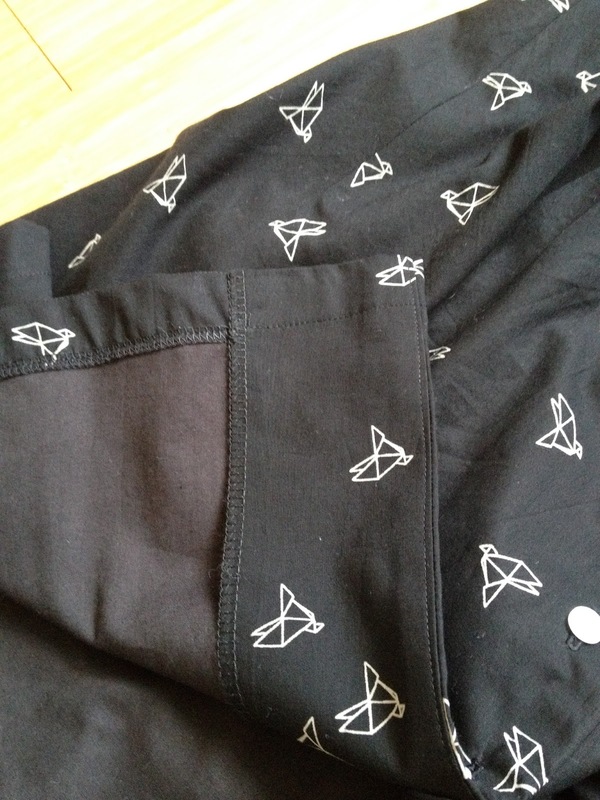 I love the white buttons, as you say they make the origami cranes pop. I was going to say I'd use one of the many floral lawns that I have in my collection, or a graduated dot border print chambray. But Alex has mentioned wax print and I can see that really working well, so that's a possibility too! I do need some more solid coloured items though, so I may go for something more neutral... This would work really well with feeding Boy J as well as being great for work (if I rein myself in on the print front!). Gotta find some time to sew first though!! What a beautiful dress Fiona. 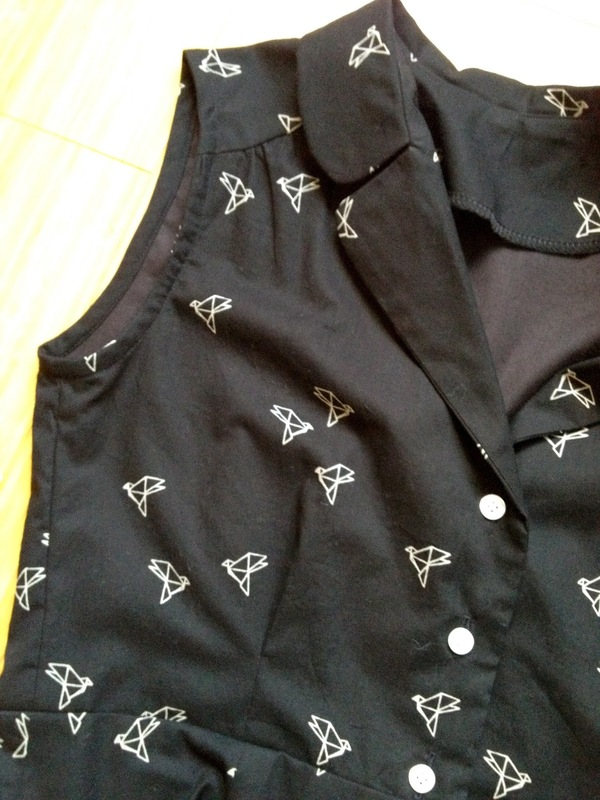 And what a beautiful fabric: I love the folded birds (they look a bit like folded cranes. Thanks for the link to Emmie. I've I'm going to be the lucky winner of this giveaway I'm definitely trying het method. I love this dress and have wanted to take the class forever but just have not been able to make it work. So glad to have the opportunity to buy (or win!) the pattern! I would love to make it in something like the yellow fabric Lisa used for the photos on her site for the class. 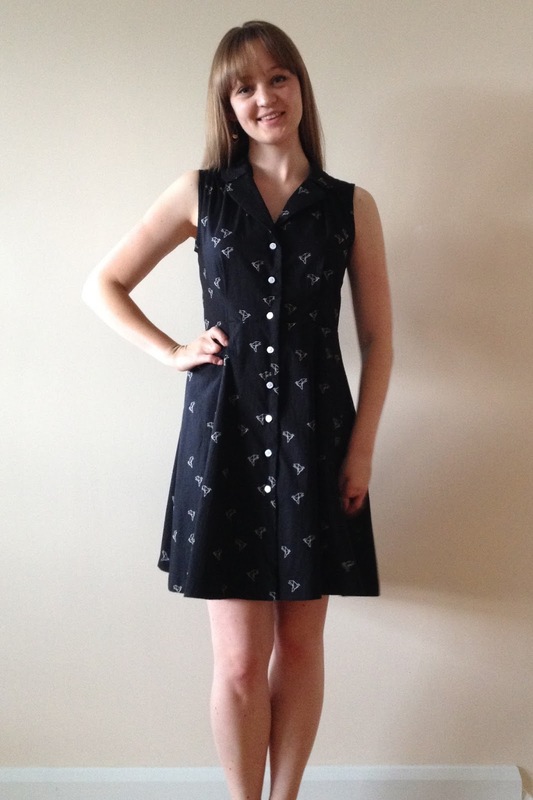 gorgeous dress and great print! would love the pattern! I have loved every single version of this dress I have seen. If I was to make it I'd like to use a striped cotton, to sort of suggest a man's shirt. I love it! 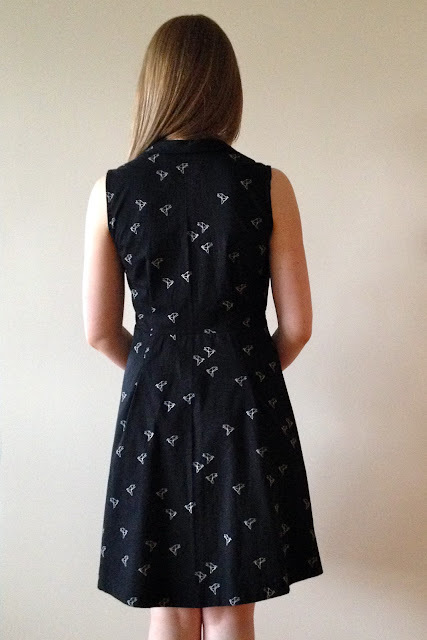 I have a Morrocan tile print fabric in my stash that would suit this dress perfectly! Love this version...I agree that the monochrome is feminine without being too twee. 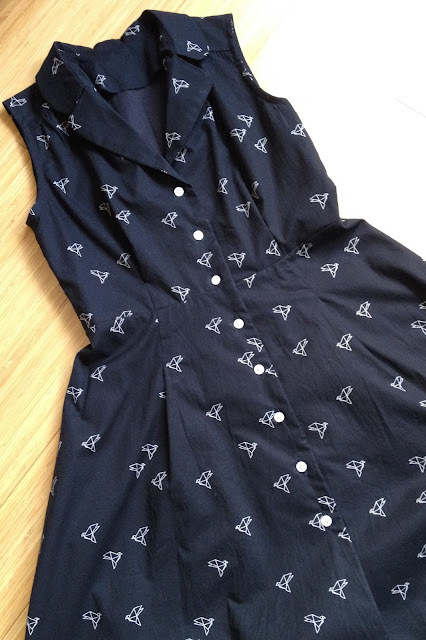 I'm itching to make a plain navy shirtdress for this summer. I have the shoes already to go...just haven't found the fabric yet. 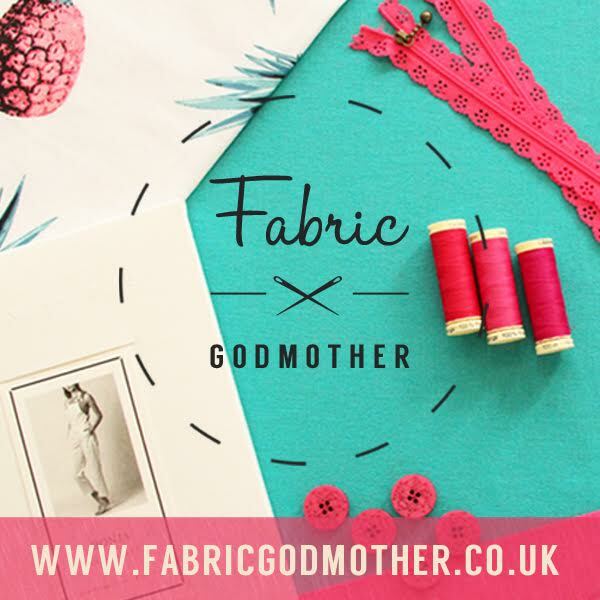 Much as I'd love silk, it's going to have to be a lightweight cotton for practicalities sake. Love the dress! I have this fabric too bit haven't used it yet due to it being more sheer than I expected. I really want a shirt dress for summer now, maybe in a Chambray! LOVE your version. The more I see of this pattern the more I want it! I think I'd make mine a light floral cotton for summer! It sure looks nice and I would love to make one myself. So count me in! I would love to make this pattern for my daughter in a light colored solid. She's not much of a print girl. Wow, I love this dress. I wasn't bothered about this pattern before but now I've seen your dress I'm thinking again!! Beautiful dress! I love the little origami birds - so cute! Great choice of fabric. Love to win this pattern. 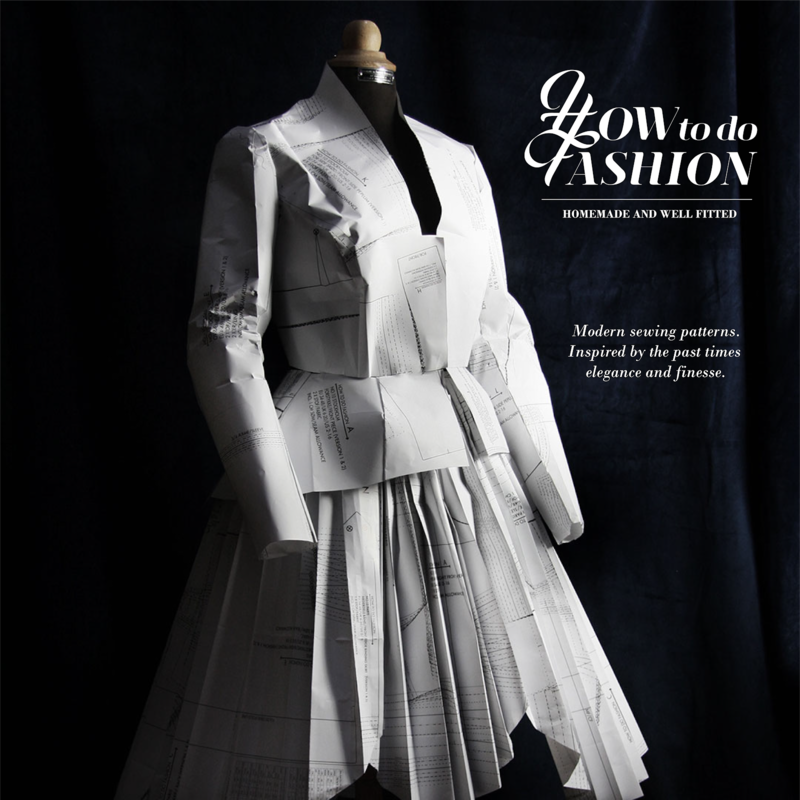 There are a few sewists making this dress: yours is one of the best. I just ordered the pattern for myself this past week. Cannot wait for it to arrive and am deliberating between two choices of fabric: one with small flowers in taupe and cream, one navy blue with Queen Anne's Lace on it. Either way, this is a stunning little dress. You look great in your creation! So so pretty, but not too girly! I tend to avoid vintage-inspired patterns but this looks so cool and modern in this fabric. 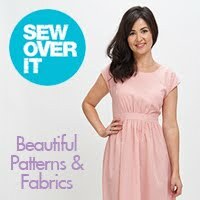 Lovely dress - I must take a deep breath and jump into doing buttonholes - haven't attempted them for years! I love the thought you put into your projects - balancing the girliness with your fabric and color choices really worked, it looks like a dress you could easily wear every day. I also love the origami crane print! Personally, I love a nice bright shirtdress for summer and I've been looking for a good pattern to make a sunshine-yellow dress, so a crisp cotton in yellow would be my ideal fabric. 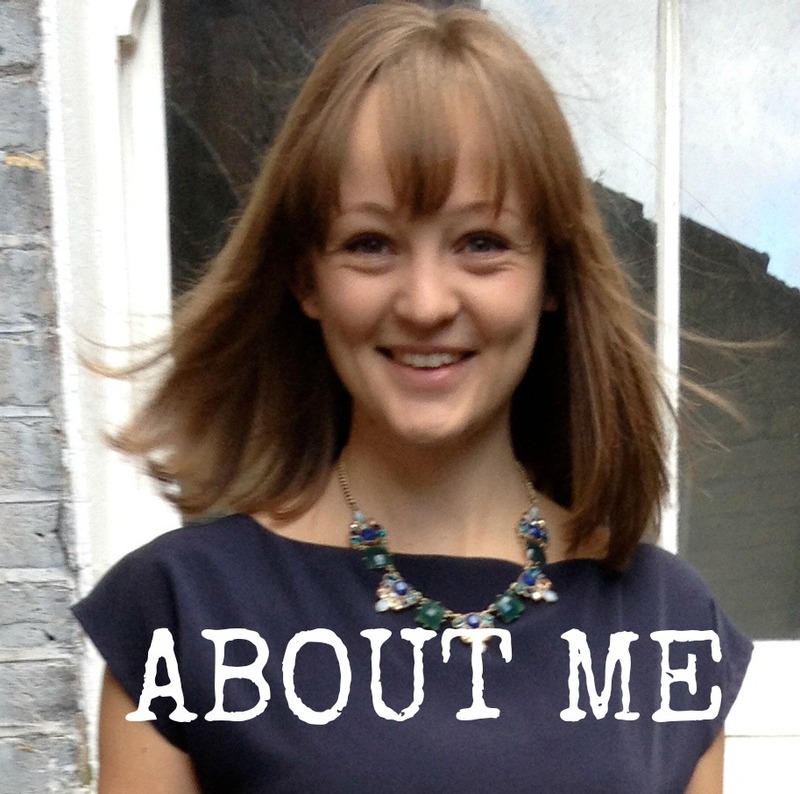 My e-mail is brigid.l.randolph(at)gmail(dot)com. LOVE the fabric! It's perfect for that dress. This looks like the perfect summer dress. Just enough of a slowing skirt without feeling like it's too much. Love the whole style. You dress is lovely. I'd love to have a go myself, think it would be a bit of a challenge! Thanks for the giveaway. This pattern keeps popping up and catching my eye. I think for summer a lovely cool lawn would be in order! Your dress looks fabulous - I think it would look great in a lightweight denim too, that would be my choice. 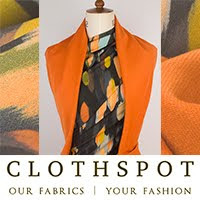 The pattern looks great, and your make from it suits you really well and looks very professional. I'd love to win a copy of the pattern. Loove your dress and love the pattern!! This dress is completely adorable. I love sleeveless dresses - they're so comfortable. I spotted the most fabulous white and coral ombre geometric-printed fabric in a market recently. I'd love to make it into this dress. This dress looks fabulous on you, I love the fabric that you chose. Shirt dresses are on my mind lately since I am 7 and half months pregnant and shirt dresses are perfect for nursing in (which I will be doing for the next year). I would love to try making the sleeved version in a wool fabric for winter. I love the fabric you used! 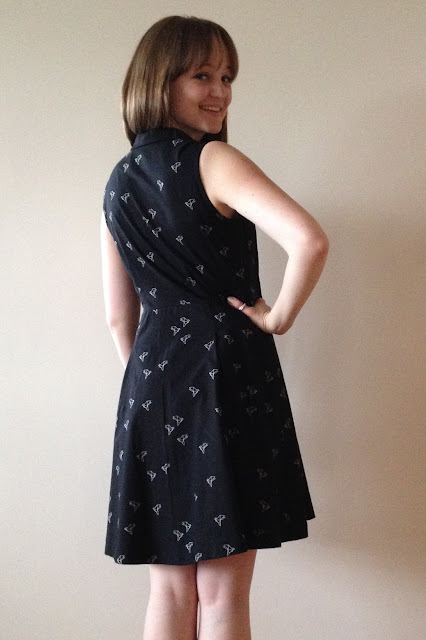 I've been meaning to make a shirt dress for a while now, and this seems like a perfect opportunity. Absolutely beautiful dress! Congratulations. You have a great talent! This looks so very cute on you! I mean, everything does, but this looks PARTICULARLY cute! Oh, this is lovely on you! Makes me want to buy the pattern and give it a try. It looks like it could work with my narrow shoulders and small B bust... May I ask what your upper bust and full bust measurements are? Thanks Sofia, it's a cracking little classic style which end up beautifully finished so I recommend it! I have small shoulders too and didn't have to do any adjusting in that area. I wear a D cup bra but my full and upper bust measurements aren't that different 34" and 32.5". I hope that's helpful! 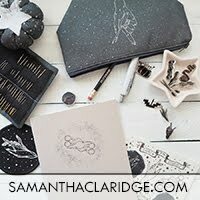 I love hearing from readers of my blog so please feel free to leave a comment letting me know what you thought about this post/make! 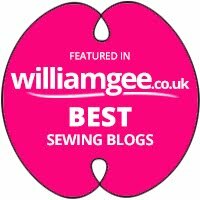 Any hints or tips to improve my sewing are always much appreciated too!